After more than 24 hours of traveling between airports (Brussels-Madrid-Johannesburg-Cape Town), we finally arrived at CPT (Cape Town International Airport) around 5PM. Being August, thus South-African winter, the sun was already setting when we set off with our rental car towards our hostel in Cape Town’s Green Point. There were a number of hindrances that complicated us getting there: an unfamiliar car (I didn’t discover my 1st and 2nd gear until the next morning), driving on the “wrong” (left) side of the road, darkness falling, no gps, and taking the wrong exit. Moreover, we had read that Cape Town is one of the most dangerous cities in the world, and some neighbourhoods should be avoided, especially after dark. We did cross some of those neighbourhoods during our hectic evening drive, so we didn’t really feel like stopping to ask for directions. It took us over an hour to find our place to sleep. Thus, our first aquaintance with Cape Town was rather nerve-wrecking and unpleasant. 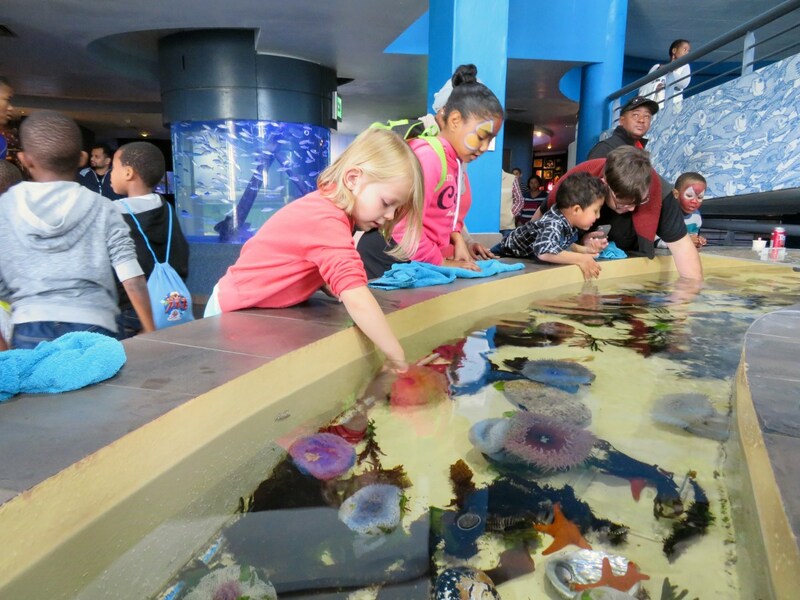 If you are in Cape Town with your kids, the Waterfront is where you want to go. OK, it is by far the most touristy spot in town, but it makes up for that with a relaxed atmosphere (usually including live bands on the street), a sense of safety (something we didn’t always feel in this city) and lots of fun things to do for kids. Pass by the impressive Green Point stadium for some “Oohh’s” and “Aahh’s” of amazement, then follow Beach Road. Just opposite New Somerset Hospital, there is a colourful stairway with a beautiful view over Breakwater Boulevard. 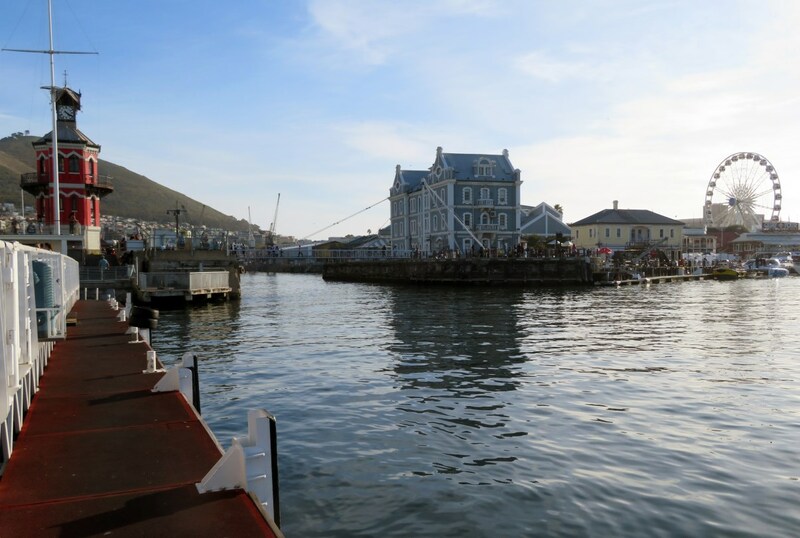 Dock Road will take you to Victoria Wharf and the Cape Wheel. This Ferris wheel offers beautiful views over the city and our daughter loved it! Adding to the excitement, there is a large playground across the street. 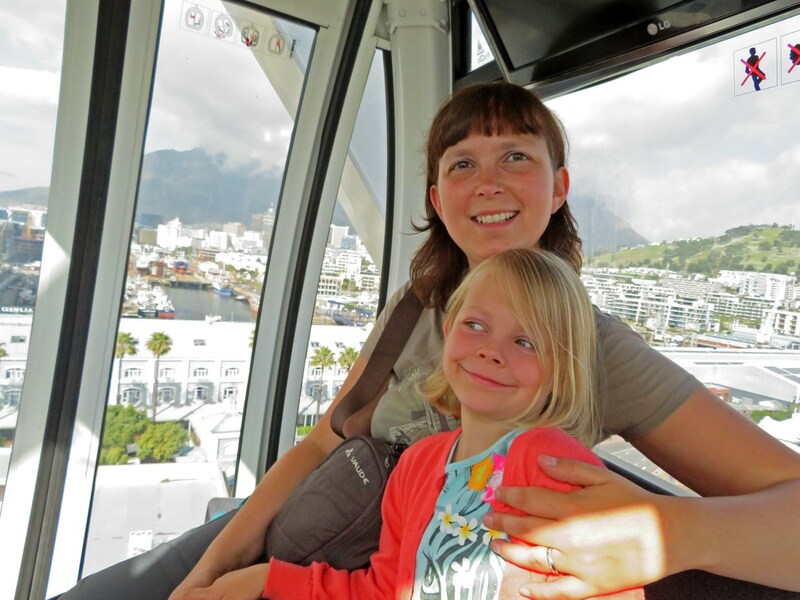 Being happy in the Cape Wheel. The Two Oceans Aquarium was another big hit for all of us. It is very child-friendly: there are child-only exhibits (with passages too small for adults), interactive games, an inside playground and a touch pool. 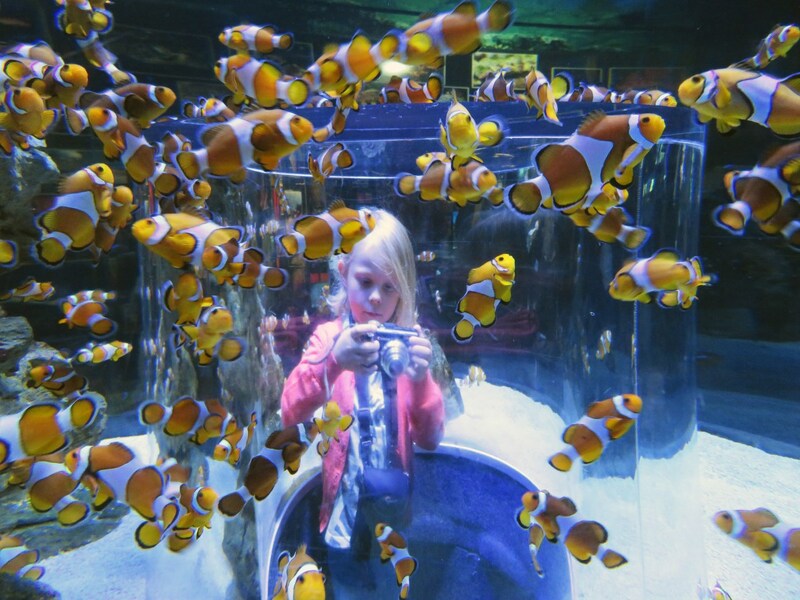 The clownfish tank and the penguin exhibit were Febe’s favourites, although I do think all aquaria are worth looking at. Go to the brightly-coloured Clock Tower (and its playground) across the Marine Swing bridge. There’s a signpost here that shows directions to cities from all over the world (and it’s the perfect geography test for your kids if they are a bit older already). If you are interested in the life of Nelson Mandela, this is also the place to be. 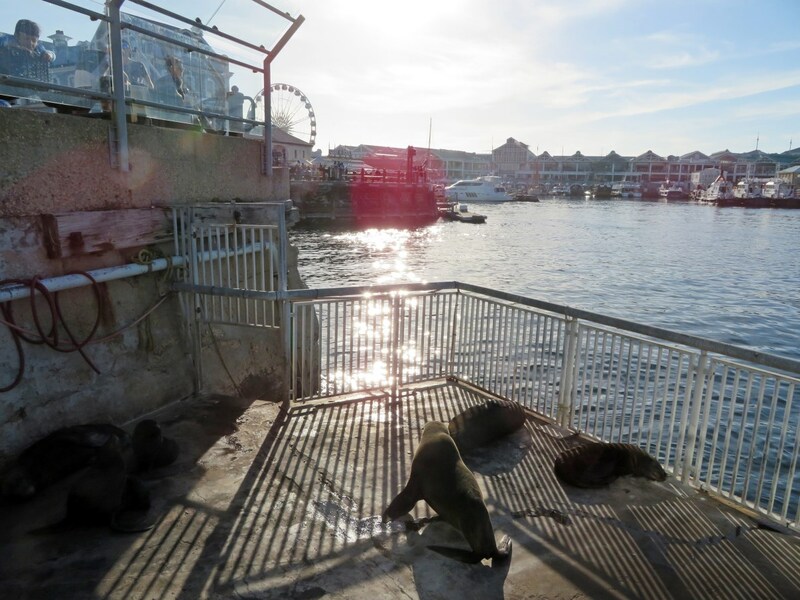 Walk up to the pier and you will pass a secluded shelter for Cape Fur Seals. The animals are used to people and just go their own way, happily jumping in and out of the water. Perfect for up-close observation of these wonderful marine mammals. From left to right: the Clock Tower (red), the African Trading Port house (blue) and the Cape Wheel. At the end of an exciting day, it’s time for an ice cream for the kids and some beers for mommy and daddy. 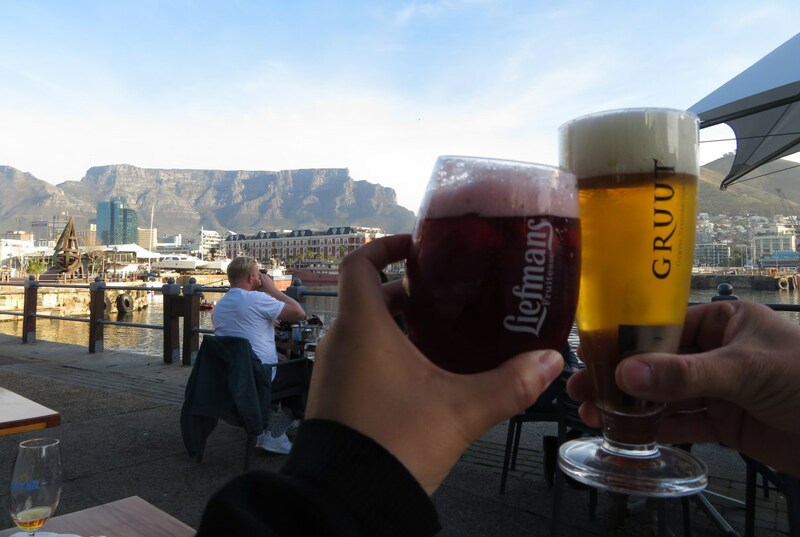 Go to Belgian beer restaurant Den Anker and you’ll get the most splendid view on Table Mountain for free! Belgian beers! And Table Mountain. If you think penguins can only be found in the Antarctic, think twice. 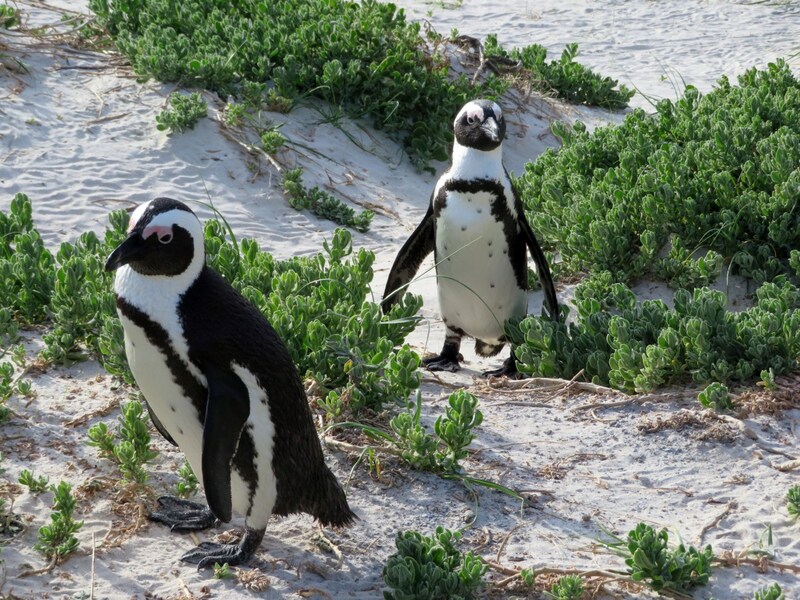 There is a large colony of African Penguins (also known as jackass penguins) near Simon’s Town, on a beach surrounded by giant boulders. 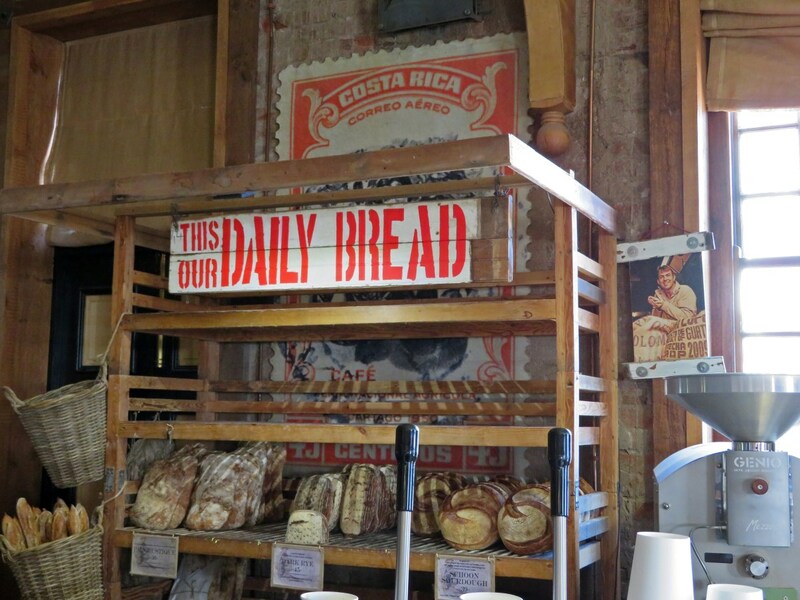 It’s a popular place, so you probably won’t be alone here, but it definitely is a must-see! 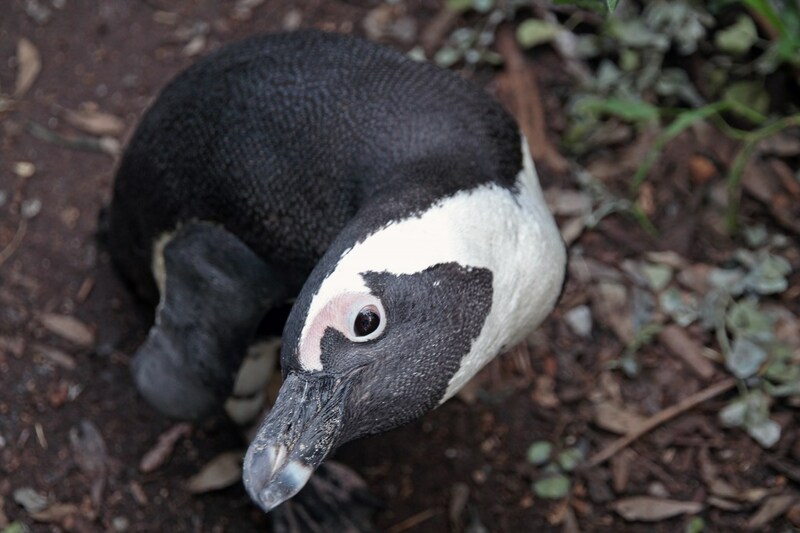 There is a wooden boardwalk that will take you to Foxy Beach, the best place for penguin-viewing. 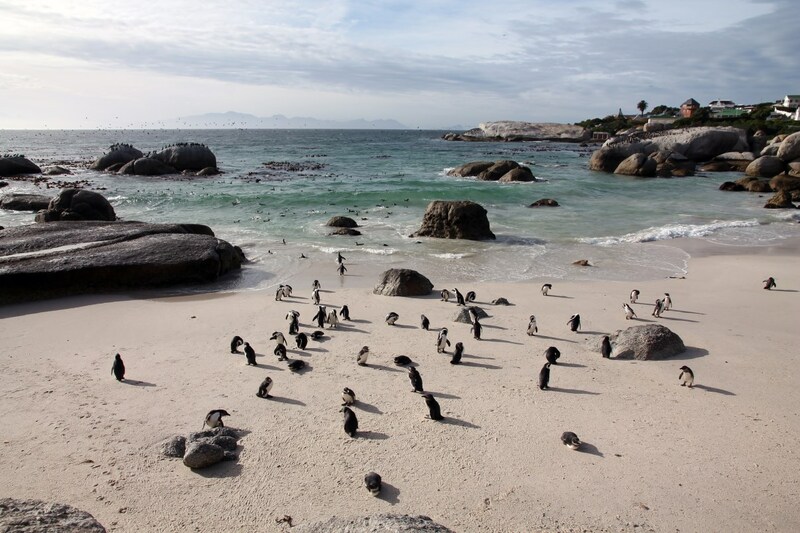 You really should try to go onto Boulders Beach as well (it’s included in the price), even though you might not see that many penguins here. It’s a beautiful place for a relaxing walk. 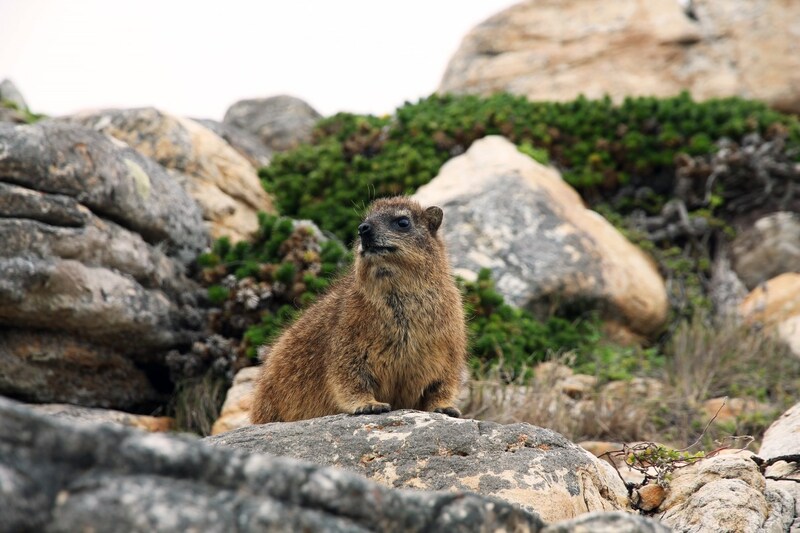 Look out for Rock Hyraxes here! The penguins at Foxy Beach. Curious penguin observing a curious human. 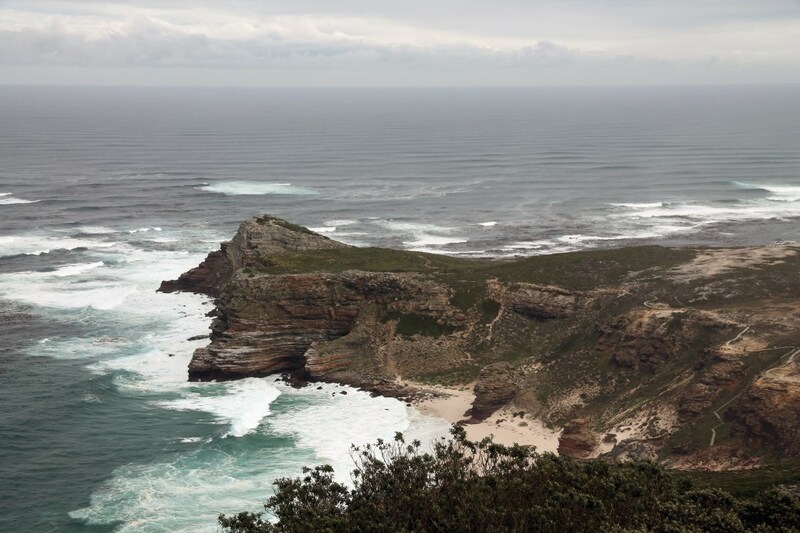 If you are in Cape Town, the Cape Point Nature reserve is a mandatory day trip. Most people go to Cape Point and its lighthouse. If you are in good shape, you can climb up the stairs until you reach the lighthouse, but taking the Flying Dutchman Funicular is a kids-friendly alternative. The little platform around the lighthouse provides spectacular views over the South Atlantic Ocean, the eastern spurs of the Cape Peninsula ànd the Cape of Good Hope. The Cape of Good Hope, as seen from Cape Point. Although it’s nowhere near the southernmost point of mainland Africa (that’s Cape Agulhas), the Cape of Good Hope does have a great historical relevance: it has been an important point of reference on the trade routes towards the far east since the 15th century. 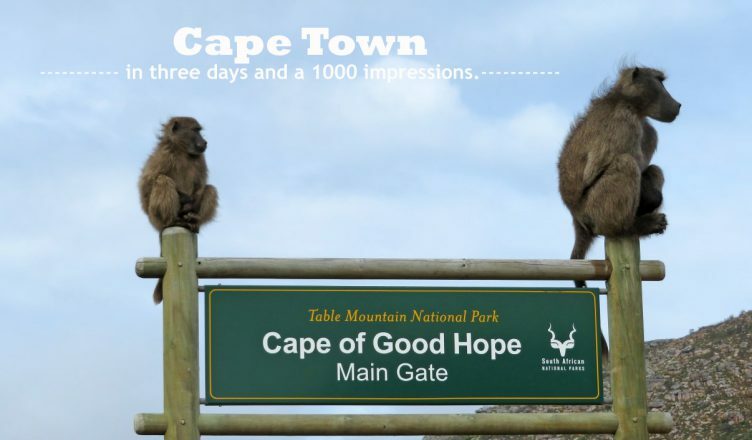 Nowadays, it is less popular with tourists than Cape Point, but we couldn’t really figure out why… Less crowds, the same view, and much more wildlife to be seen. On our way to the Cape, we passed a few ostriches and sacred ibises, and there was a large troop of Chacma baboons near the car park as well. I was really annoyed with the way people interacted with these monkeys, throwing bags full of crisps towards them to lure them in for a better picture. We had to explain to some people that the crisps are not healthy for the animals and that they can become very aggressive. They just didn’t realise… I really do think some more supervision is needed here! At Cape of Good Hope. 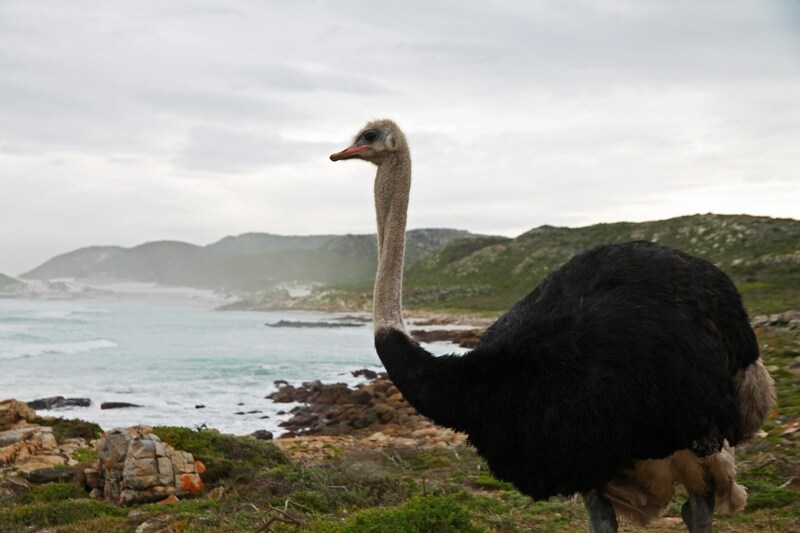 Ostrich by the sea: not a common sight! The baboons were eating the yellow flowers of this shrub. The climb up is not very difficult and there are quite a lot of rock hyraxes here as well. Cute! 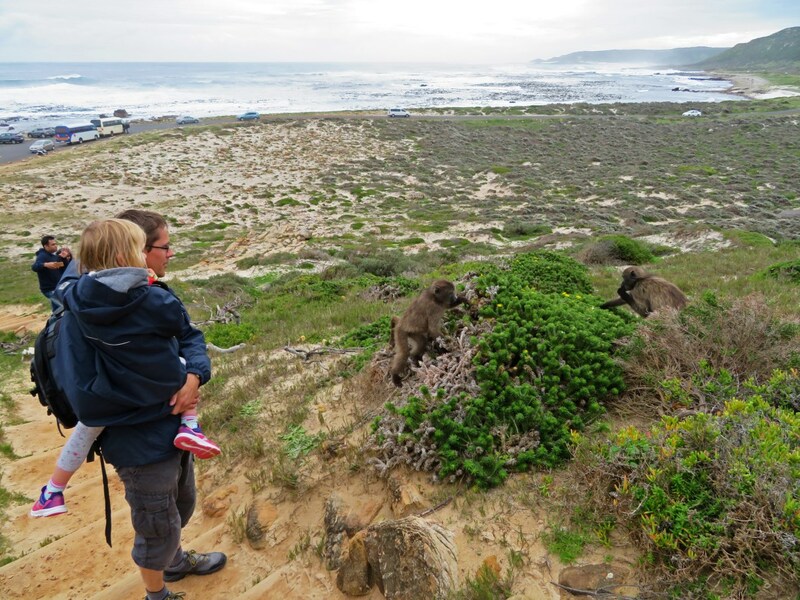 We had some time left to explore the Cape of Good Hope Nature Reserve (part of Table Mountain National Park), and drove up to the beach of Platboom Bay. What a wonderful and idyllic place! 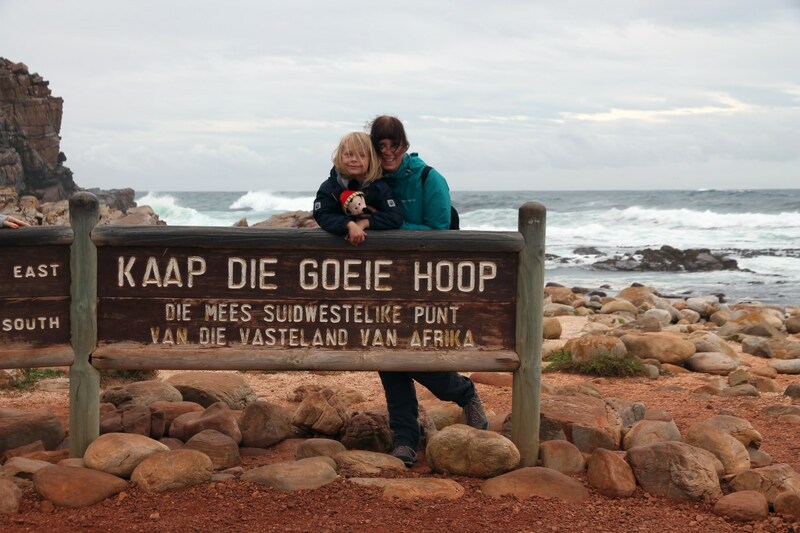 The sea, the views, the beach, the dunes… When you go to Cape Point, you just have to pass by here! 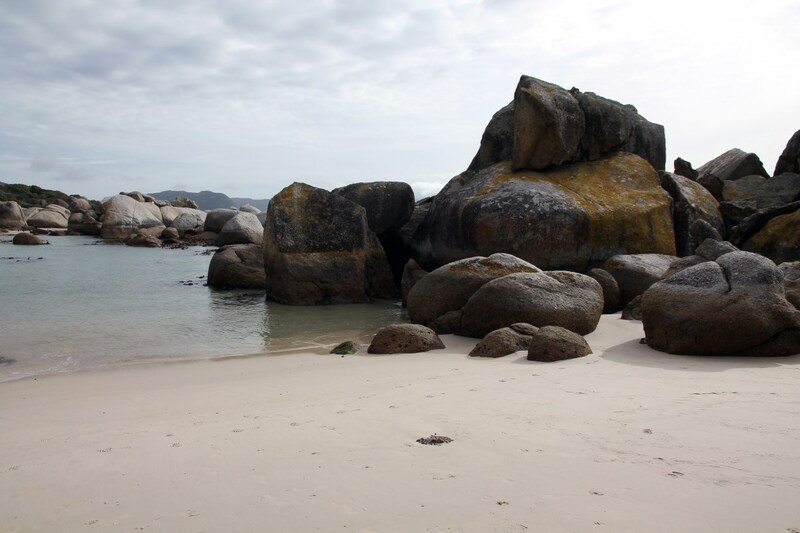 The beautiful beach at Platboom Bay. 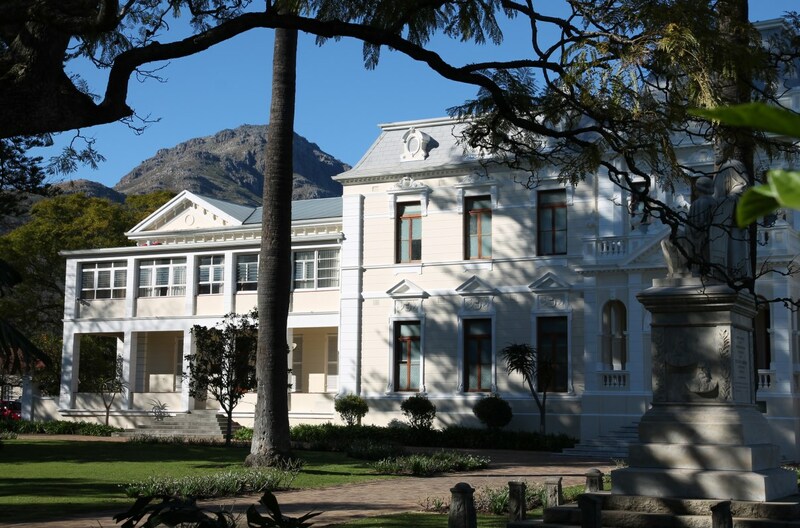 Stellenbosch is known as the centre of the largest wine-growing region in South Africa, the Cape Winelands. It produces world-renowned wines that are sold all over the globe. 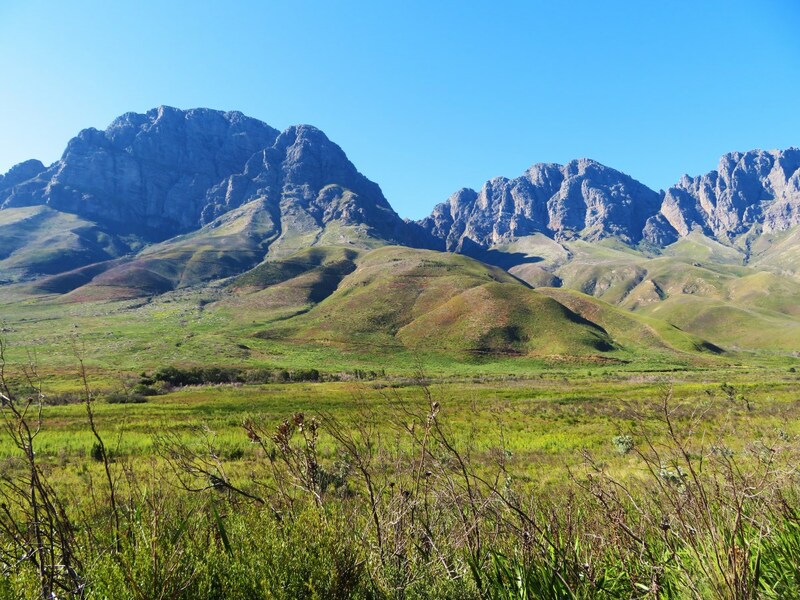 In summer, the vineyards are lush and green, defining the landscape around Stellenbosch town. In winter, however, the grape vines are resting. Nevertheless, many of the large wine farms are still open for a tasting or two. 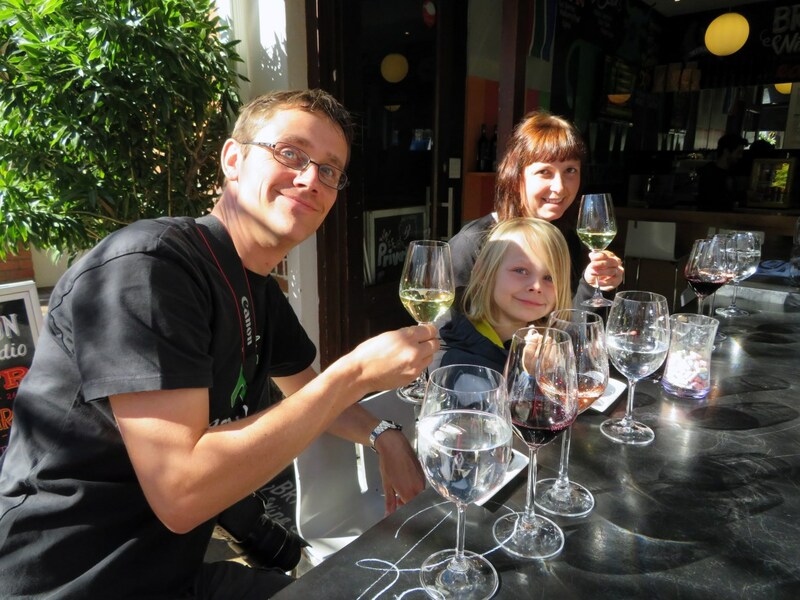 We decided to broaden our horizons beyond the unevitable wine and went on a Bites and Sites Foodies on Foot Tour in the quiet town of Stellenbosch. Our guide Hanli, donning a red Bites and Sites apron, lead us on a relaxing walk through the shady, oak tree lined streets. Along the way, she showed us the most important historical buildings, such as the Moederkerk church on Church Street, the Kerkhuis (Church House), the impressive Stellenbosch University building and the 18th-century Schreuderhuis (an original pioneer house) in the Stellenbosch Village Museum. 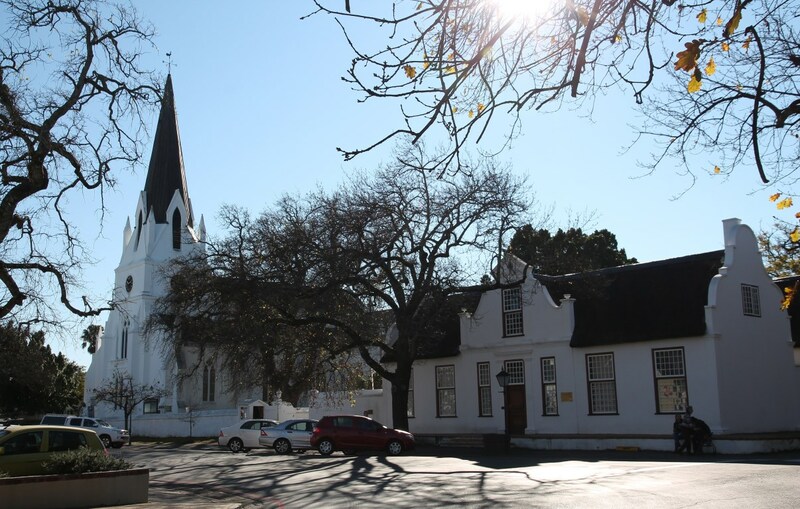 She enthusiastically narrated the life story of Simon van der Stel, founder of the city, and other aspects of Stellenbosch’ history. 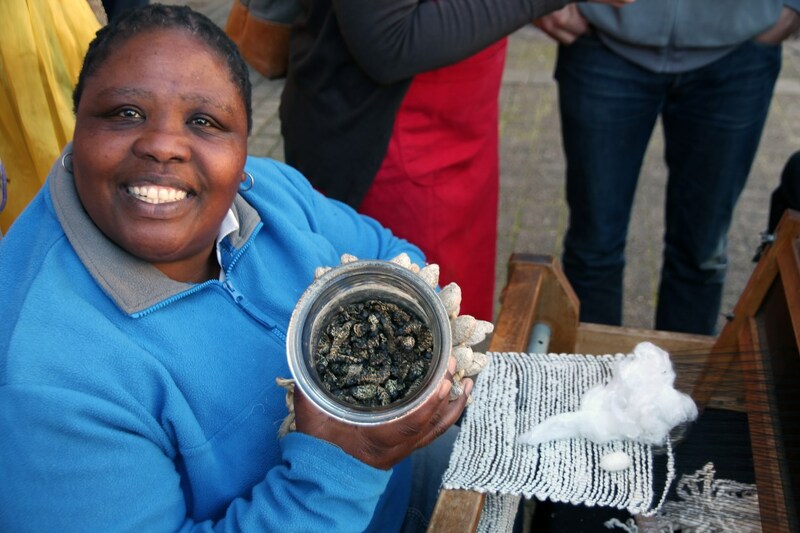 The real stars of the day, however, were the local artisans and their produce: biltong and droëwors (dried meats) from a family butchery, a pairing of local wines and home-made chocolates, freshly baked artisan bread etc. It was a lovely and very tasty visit! Silk weaving and silk moth cocoons. 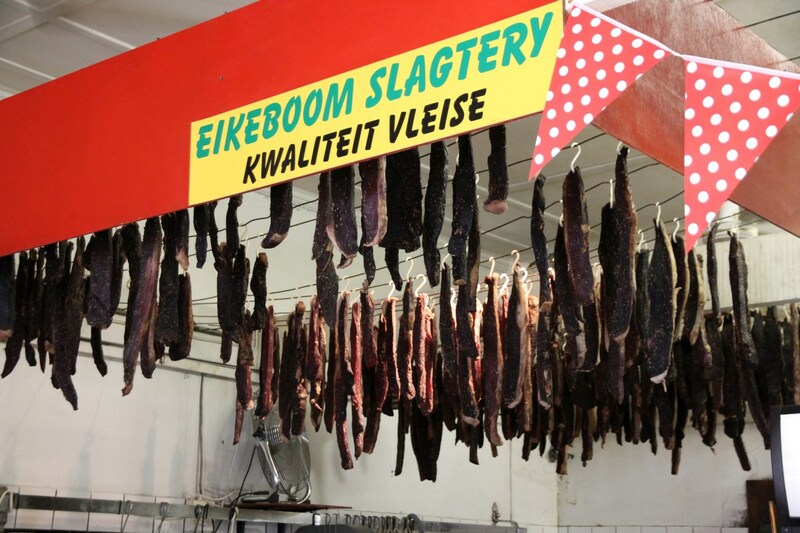 Biltong, drying in a family butchery. 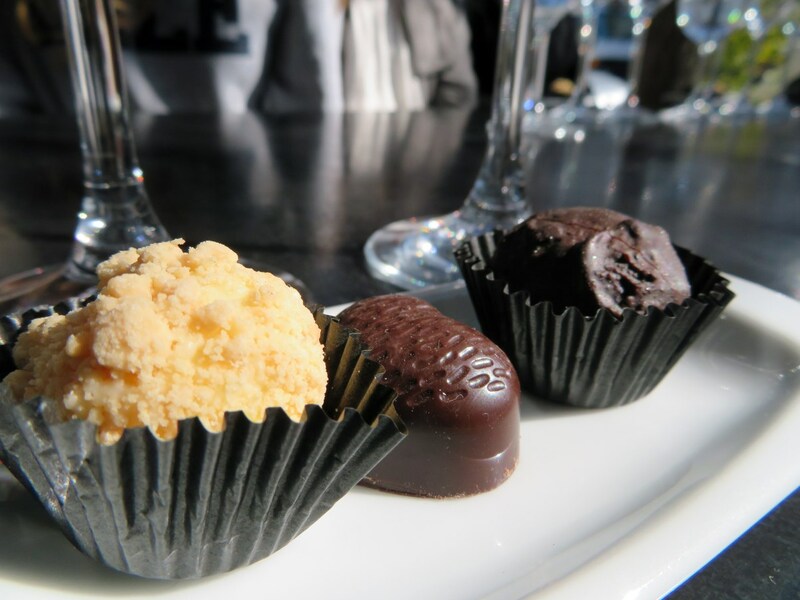 Wine and chocolate pairing is fun! Only 10km (about 6 miles) east of Stellenbosch, a visit to Jonkershoek is definitely recommended. The perfect place to clear your mind after a culinary feast. We were short in time, so decided to follow the 10km loop, along the Eerste River, by car. It was a mistake. Our small Hyundai was not suitable for this kind of ‘road’, which was in really bad condition: a succession of holes and protruding rocks. It took me over an hour to get back to the entrance. It was a rented car, so I was extra careful. Although I had to keep my eye on the ‘road’ most of the time, I stopped several times to take in the views. The nature here is overwhelming: blooming Protea shrubs in front of a backdrop of the majestic Jonkershoek Mountains. There are quite a few hiking trails here, which I would recommend although we didn’t walk them ourselves: this is a magical place, but just don’t take your car unless you drive a 4X4! The Jonkershoek Mountains are so beautiful! Such an abundance of flowering plants! 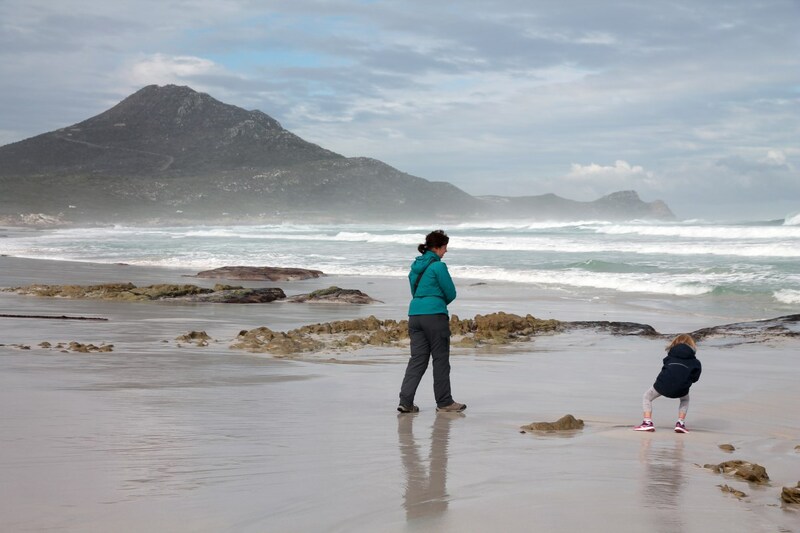 As you can see, the Cape Region has a lot to offer for travelers. We were limited in time, and we’re aware that we haven’t seen all the highlights. We skipped Robben Island, because it just isn’t possible with a 6-year-old. Table Mountain was off limits, because the Cableway was having its annual maintenance when we were there. And we didn’t have the time to fit Kirstenbosch Botanical Garden in. Maybe next time? Maarten has been here before in 2006. You can read about his impressions at that time here. 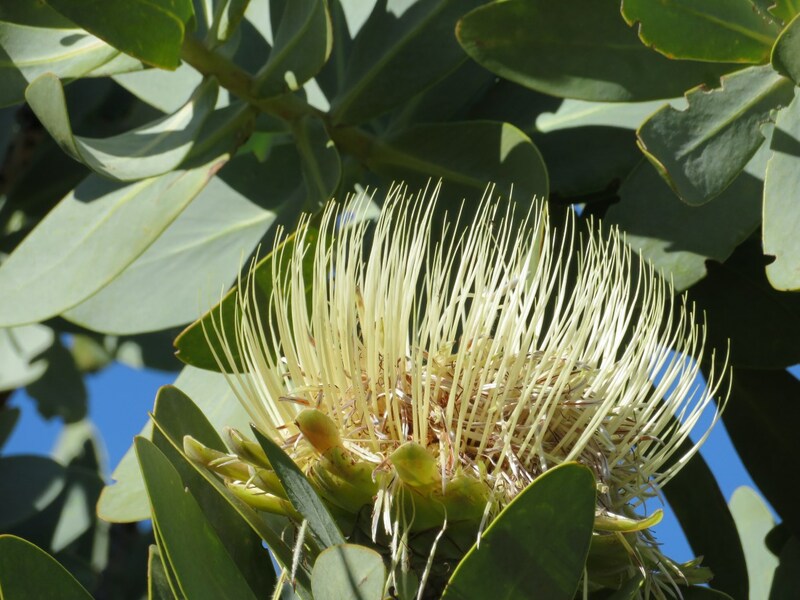 One of the world’s great centres of terrestrial biodiversity, the Cape Floral Region is one of the most special places for plants in the world in terms of diversity, density and number of endemic and threatened plant species. It is considered one of the six Floral Kingdoms of the world. The protected areas contain an extraordinary assemblage of plant life and its associated fauna. 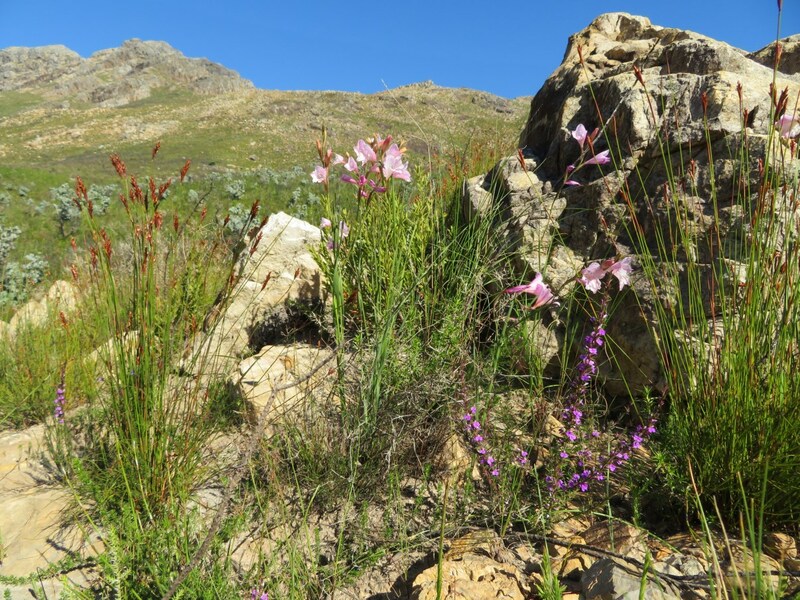 A significant number of endemic species are associated with Fynbos vegetation, a fine-leaved sclerophyllic shrubland adapted to both a Mediterranean climate and periodic fires, unique to the Cape Floral Region. Heel leuk dat je onze blog blijft volgen! We hopen snel wat nieuw materiaal online te krijgen, want het is nogal druk nu op school (voor beide). Proficiat! Schitterend gedaan: prachtige foto’s, leerrijke tekst! Als je de blog bekeken hebt, krijg je zin om naar Zuid-Afrika te vertrekken! Dit moet een droomreis geweest zijn!